September 20, 2017– Nucor Building Systems, a leading manufacturer of custom-engineered metal building systems, is pleased to announce the addition of Linkan Construction as an Authorized Nucor Builder. By partnering with Nucor Building Systems, Linkan Construction is now able to offer its customers a wide array of high-quality building solutions that are custom designed, yet cost-effective, energy efficient, and faster to erect than conventional construction methods. Based in Elko, Nevada, Linkan Construction is a general contractor specializing in custom buildings for the mining industry. For more information, visit: linkan.biz. Nucor Building Systems, a division of Nucor Corporation, has been a leader in the design and manufacture of custom-engineered metal building systems for more than two and a half decades. With four full-service plants strategically located throughout the country in Waterloo, IN; Swansea, SC; Terrell, TX; and Brigham City, UT; Nucor Building Systems offers competitively priced buildings that are delivered on time and fit together in the field, with unbeatable service and solutions that work. For more information about Nucor Building Systems, visit www.nucorbuildingsystems.com. 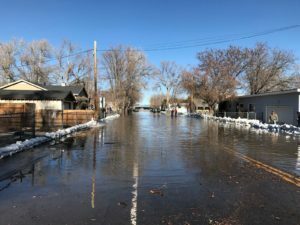 Linkan Engineering and Construction is happy to help local Elko residents in the aftermath of the February 2017 flooding. With houses and basements full of water and no means to start the recovery process, Linkan has been able to use our water-related resources to assist area residents. 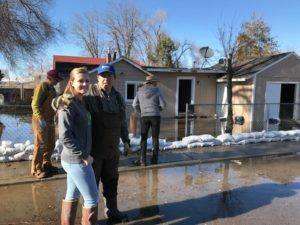 Flood waters have gone down and the long process of fixing homes has now begun. We look forward to seeing in Denver. Be sure to stop by our booth #925 and find out how our creative and innovative thinking can help you meet your challenging water management needs. 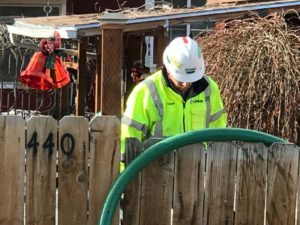 Linkan has upgraded their Nevada General Engineering Class A license to a $4,500,000 monetary limit. Linkan uses the design-build concept to successfully deliver water infrastructure projects with superior results. We are not just a contractor or an engineer, we embody all disciplines to design and construct as an integrated service. The roles of engineering design and constructor are unified to streamline the delivery of the project. This unique ability allows us to complete a project faster, more cost effectively and with optimized project quality. Linkan Engineering is pleased to announce the date of our next water conference. The 3rd Annual Northern Nevada Mine Water Conference will be held at the Elko Convention Center on September 29, 2015. Our conference focuses on sharing technical information among water professionals in the Nevada mining industry. A Call For Papers is open through August 15, 2015. If you have relevant technical information to share with your colleagues, submit a abstract no longer than 400 words to sam.billin@linkan.biz for review and approval. See you in September! Additionally, Mr. Sam Billin will be presenting a Water Management short course in concert with Itasca Denver on Feb 14-15, 2015. We look forward to seeing you at the Annual SME conference and are eager to share our most recent research and development with you. Join us Tuesday for a great technical conference on local water issues for mining operations in Nevada and the western United States. A total of 18 technical presentations including equipment demonstrations and hands on water sampling training. Look forward to seeing you there. Linkan Engineering is pleased to announce our selection by Barrick Goldstrike Mines Inc as their Contract Operator at the Goldstrike facility. Barrick Gold is the largest gold mining company in the world and operates an innovative gold recovery process using thiosulfate instead of cyanide. Linkan provides contract operation and consulting services to operate the 27,000 square foot facility. Capable of 4,000 gpm, the process utilizes membrane technology in this first of its kind mine water treatment process. Linkan Engineering is pleased to welcome Mr. Scott Barton to our team of dedicated engineering professionals. Scott is a Process Design Scientist with 20 years experience in process design and operation for mineral and metals recovery facilities. He is a graduate of University of Nevada – Reno (Go Wolf Pack!) with a Bachelor’s of Science degree. Having provided key technical support for several innovative natural resource recovery plants, Scott supports the chemistry and process design elements of our design team. Welcome Scott.